 Black Cherry (Prunus serotina) - a tree.  Pin Cherry (Prunus pensylvanica) - a tree. Habitat: Fields and Open Areas; Open areas. Uses: Edible fruits, although they are VERY tart! Edible: Edible but extremely tart, hence the name! Notes: The fruits are edible, although very sour - hence the shrub's name. Photographs: 121 photographs available, of which 3 are featured on this page. SCROLL DOWN FOR PHOTOGRAPHS. 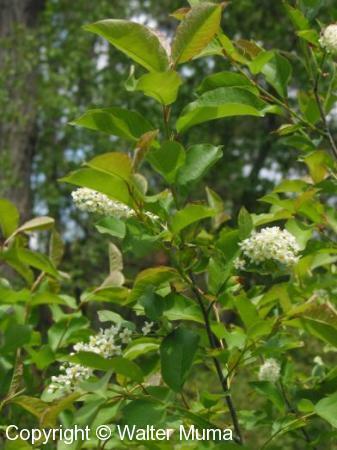 Here is an overall picture of a Chokecherry shrub, in spring, in flower. Close-up of a branch with leaves and flower cluster. Close-up of the flowers. Note how the are arranged along a stem, and hang down. They are fragrant. This picture was taken in late May.